New house *** in Ribeauvillé on the Wine Route - Gîte rose "Vosges"
Property 9: New house *** in Ribeauvillé on the Wine Route - Gîte rose "Vosges"
New house *** in Ribeauvillé on the Wine Route - Gîte jaune "vignoble"
Property 26: New house *** in Ribeauvillé on the Wine Route - Gîte jaune "vignoble"
Tourist apartment, luxurious and ecological - 4 to 6 per. Property 27: Tourist apartment, luxurious and ecological - 4 to 6 per. 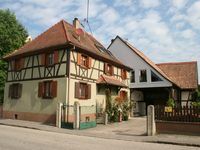 LE68320 Cottage 10mn from COLMAR - HEATED POOL accessible May to end of September - Gîte "ANTOINETTE"
Property 35: LE68320 Cottage 10mn from COLMAR - HEATED POOL accessible May to end of September - Gîte "ANTOINETTE"
LE68320 Cottage 10mn from COLMAR - HEATED POOL accessible May to end of September - Gîte "AMELIE"
Property 43: LE68320 Cottage 10mn from COLMAR - HEATED POOL accessible May to end of September - Gîte "AMELIE"
Everything about this stay was delightful. The cottage is so lovely. Katia, a talented artist, has decorated the interior with a French warmth you would hope for on such a trip to the storied Alsace. The town is welcoming and a perfect size for strolling. There is a pizza place a block away (get the Melba dessert! ), a bar across the way with a friendly neighborhood dog that visits, and a town square out of a storybook. We brought our dog and she was welcomed in many of the restaurants when it was too chilly to dine outside. 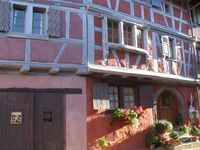 We had private parking, so we were able to bring our car and drive to neighboring towns (Colmar and Riquewihr especially) easily. We appreciated that this town was not overrun with tourists but easily had all the charm of the area. The wines are wonderful! There is a bakery and a shop within a short walk from the cottage for all your snacking needs. I would highly recommend this very clean, updated (but still charming!) cottage. It was the perfect location!